...that Vex Axis Minds can simultaneously control over a million Vex units? ...that the Future War Cult was granted access to the Tower after another faction, the Concordat, was dismantled for attempting to overthrow the Speaker? ...that the Sidearm Special weapon class was first introduced in House of Wolves with the Vestian Dynasty and Dreg's Promise? ...that Destiny patch 1.2.0.5 temporarily removed Special Orders vendor Tess Everis from the Tower? This article is a stub. You can help Destinypedia by expanding it. The Infantine is a massive Ogre in the Dreadnaught that is encountered in Story Mission Summoner's Circle. The Hive are attempting to infuse it with Taken power, but Eris Morn has the Guardian intervene by summoning the Ogre early. The Infantine has a unique attack; every time its fists hit the ground, it creates the Tremor debuff, which slows down the player and prevents them from jumping. This can stack up to four times for increased duration and effect, at which point the player will barely be able to move around or jump, increasing vulnerability to reinforcements such as Thralls, Cursed Thralls, Knights, and other Ogres. 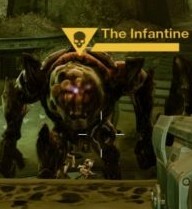 The Infantine was formerly named Lost Dreadnaught during production of The Taken King. The infantine's size is comparable to Phogoth, being at almost the same height.